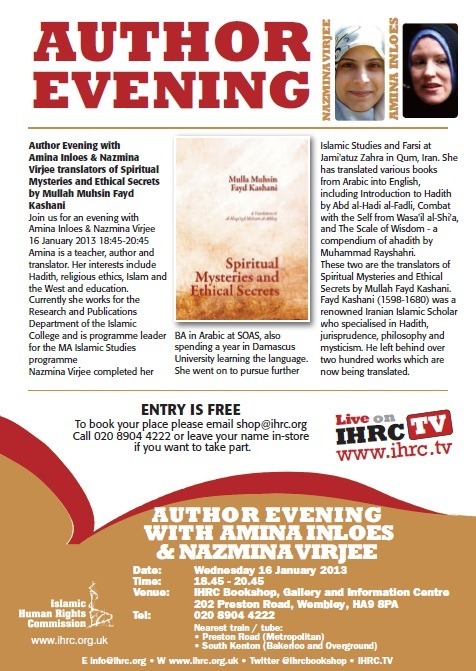 If you want to join the audience ENTRY IS FREE To book your place please email shop@ihrc.org, or call 020 8904 4222 or leave your name in-store. Download the poster at the end of the page and help spread the word. Amina Inloes and Nazmina Virjee (co-translators with Muhammad Reza Tajri) of Spiritual Mysteries and Ethical Secrets (al-Haqa’iq) (al-Haqa’iq fi Mahasin al-Akhlaq) will be joining us to discuss their work on this acclaimed text, its meanings and what the process has meant to them. Since its completion in the seventeenth century, this book has been lauded as a valuable textbook on Islamic spirituality and ethics as well as a spiritually enlightening read. This ground-breaking translation brings to light how Fayd Kashani engages with the Sunni Sufi tradition – particularly the ideas of al-Ghazzali – for the benefit of a Shi‘a audience. In addition to presenting the inner mysteries of Islamic ritual practices, Fayd also explains the nature of the human character and how to cultivate, balance, and eliminate various traits. Fayd Kashani centres his discussion on verses of the Qur’an and narrations (hadiths) from the Prophet Muhammad (S). Serving as a useful reference work, this book includes the original Arabic narrations for the reader’s convenience. Fayd Kashani (1598-1680) was a renowned Islamic scholar who specialised in hadith, jurisprudence, philosophy, and mysticism. He left behind over two hundred works, including al-Wafi, one of the most influential modern collections of hadith. Amina Inloes is a teacher, author and translator. Her interests include Hadith, religious ethics, Islam and the West and education. Currently she works for the Research and Publications Department of the Islamic College and is programme leader for the MA Islamic Studies programme. Nazmina Virjee completed her BA in Arabic at SOAS, also spending a year in Damascus University learning the language. She went on to pursue further Islamic Studies and Farsi at Jami’atuz Zahra in Qum, Iran. She has translated various books from Arabic into English.